Laa ‘ilaaha ‘illallaahu wahdahu laa shareeka lahu, lahul-mulku wa lahul-hamdu wa Huwa ‘alaa kulli shay’in Qadeer. None has the right to be worshipped but Allah alone, Who has no partner. His is the dominion and His is the praise, and He is Able to do all things. 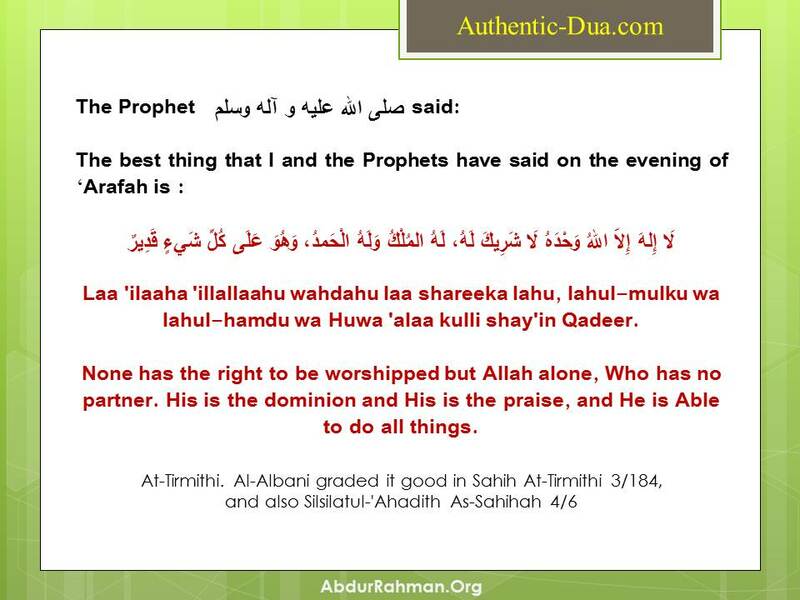 The author (may Allah have mercy on him) said: Chapter on dhikr in the morning and the evening. What he meant by morning and evening was at the beginning of the day, and at the end of the day and the beginning of the night. The morning begins when dawn breaks and ends when the sun has risen at the forenoon. And the evening begins with ‘Asr prayer and ends with ‘Isha’ prayer or thereabouts. “O you who believe! Remember Allah with much remembrance. And glorify His Praises morning and afternoon” [al-Ahzaab 33:41-42]. The “afternoon”: al-Jawhari said: This is the time after ‘Asr until Maghrib. And Allah, may He be exalted, says (interpretation of the meaning): “and glorify the praises of your Lord in the ‘Ashiy (i.e. the time period after the midnoon till sunset) and in the Ibkaar (i.e. the time period from early morning or sunrise till before midnoon)” [Ghaafir 40:55]. The ibkaar is the beginning of the day and the ‘ashiy is the end of the day. And Allah, may He be exalted, says (interpretation of the meaning): “and glorify the praises of your Lord before the rising of the sun, and before its setting” [Ta-Ha 20:130]. This interpretation is what is mentioned in the hadeeths about saying such and such in the morning and evening. What is meant is before the sun rises and before it sets. Therefore the time for these adhkaar is after Fajr and after ‘Asr. The first issue; I see many of the people those who appear to be committed not only committed to the obligatory acts of worship rather also committed to the optional acts of worship. And those are fards which are recommended such as remembrance Allah after the prayer such as saying Tasbeeh (SubhanAllah), Tahmeed (Alhamdulilaah) and the Takbeer (Allahu Akbar) and things like this. When they want to work by this hadeeth, you see some of them not even close to making a distinction with their tongue when saying “SubhanAllah” and “Alhamdulilaah” and “Allahu Akbar”. So what do you hear (and the shaykh starts imitating them by saying “SubhanAllah” very quickly). Have you seen like I have seen, I think you have. I’m not the only one here who seen this so what should we call this sabsabee (meaning what said in this fashion it cannot be called Tasbeeh). And then they go (the shaykh starts imitating them by saying “Alhamdulilaah” very quickly). This is not saying “SubhanAllah”, this is not saying Alhamdulilaah and then they go (the shaykh starts imitating them by saying Allahu Akbar very quickly). In an instance in a second, they have finished the entire 100. The one who praises Allah hundred times in the afore mentioned manner, what is the reward for this? Allah will forgive him for his sins even if they were like the foam of the ocean?. Is the reward the same for the one who says it in a rush hared manner?, Allah forbid. Therefore it is upon us to take our time and be deliberate and to say “SubhanAllah”, “SubhanAllah”, “SubhanAllah”, “Alhamdulilaah”, “Alhamdulilaah” up until the end.. I do not intend by my speech which I’m about to say to prevent the people from saying SubhanAllah 33 times and praising Allah as is found in the remaining part of the hadeeth. Rather I only intend to bring something for those who rush, something which is Islamically better for them and easier for them to do. So now we have a fiqh question, is this abrogating the first hadeeth saying SubhanAllah 33 times, Alhamdulilaah 33 times, Allahu Akbar 33 times and to the end of the hadeeth. No. this is not abrogating it but rather it is a preference, so if the person when he is finished his prayer is able to say the remembrance 33 times in a calm, deliberate manner then there is nothing preventing him from doing this but it will be better to combine these 4 phrases together and say them 25 times “SubhanAllah walhamdulillaah, walaa ilaaha illal Allah, wallaahu Akbar” .. like this 25 times and this will be better then what appears in the first hadeeth.